Fresh from the ground, the best way to eat these is with a knob of butter and a crack of black pepper. This isn’t the first time we’ve grown our own food by a long shot. Until now however, we hadn’t grown potatoes, simply because we could get them cheaper from local farmers at their gates. With the bad weather over the past 2 years, the price of potatoes has been steadily on the increase so this year we decided to grow our own. Excitement filled the air in the polytunnel this afternoon when my hubby and 4yo dug the potatoes up. The young man insisted on recording an audio clip when he got home and while his counting skills aren’t great, you get the idea of how many we yielded today. 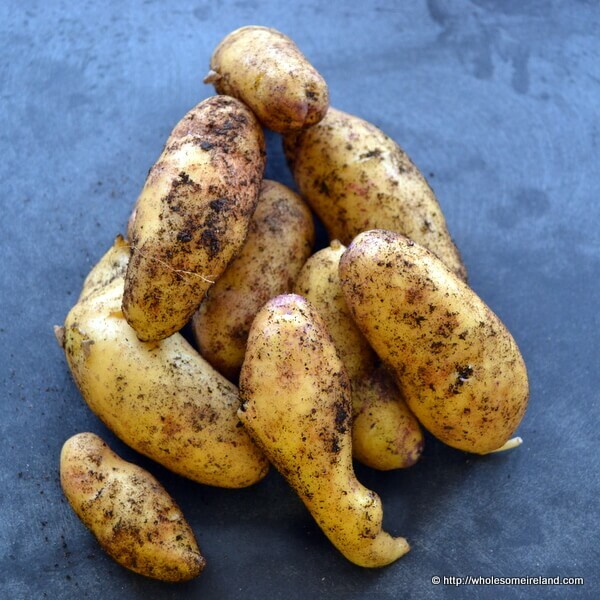 We bought seed potatoes from Sonairte and we had great advice from Kathyrn Marsh. I actually planted 3 seed potatoes live on air with Gerry Kelly from the Late Lunch on LMFM under Kathryn’s expert supervision! Since that first day we planted many more potatoes in succession, a couple every week. Today’s haul from just 3 seeds yielded 2.75kg of fresh new potatoes. I’ll simply rub them clean under running water, we haven’t used any chemicals or fertilisers and the seeds were of course organic. The only thing these potatoes got was a bit of warmth in the polytunnel, oodles of well rotted manure, and water from the ground well on site. You can imagine the savings that just a few small string bags of seed potatoes will give us over the next few months. Once clean, I’ll steam the potatoes and we’ll eat them with a knob of Irish butter and a crack of fresh black pepper. Simple pleasures, enjoyed as a family. This is why we grow our own food. What a wonderful description, Emily! I’m so jealous. Ours aren’t even close to ready yet. I guess I’ll have to be patient. These came from the polytunnel Lisa. Our outdoors spuds are miles off ready still! Yay! We enjoyed our first batch yesterday and they were delicious.We’ve grown them for a few years and it really does make a difference for quite a few months in terms of not paying out for them and not having to add another bulky item to the trolley. Your son’s commentqry is adorable! He insisted on making the audio Joanna. Then clammed up and he asked me to interview him. He loves talking and telling people about growing food. 🙂 This is the first year I grew spuds, up until now it was cheaper to buy them locally. Not anymore! You wouldn’t be able to stop even if you wanted to, it becomes a compulsion!!!! I think your son is a natural….hmmmm…I wonder where he gets it from?!!!! Ah you’re very kind J!